Candace Perry: MADE IN HEAVEN goes to Ireland! MADE IN HEAVEN goes to Ireland! MADE IN HEAVEN, my short play about true love in Heaven, has been selected to be performed in the International Dublin Gay Theatre Festival, May 8 - 13. 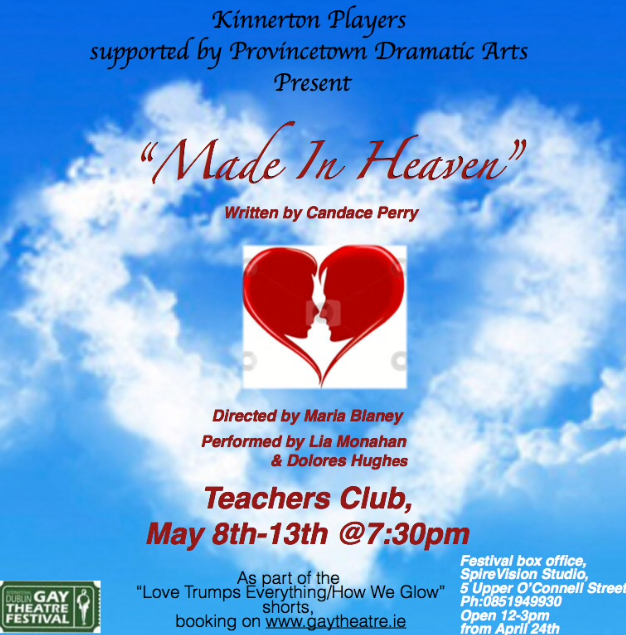 I'm thrilled to be going to Dublin to see the performance, co-produced by Provincetown Dramatic Arts and the Kinnerton Players of Dublin as part of "Love Trumps Everything". MADE IN HEAVEN is directed by Maria Blaney and features the fabulous Irish actresses Lia Monahan and Dolores Hughes. Many thanks to all the supporters who helped make this production possible!